Hamilton Fish was appointed Secretary of State by President Ulysses S. Grant on March 11, 1869, and began his duties on March 16. Fish served until March 11, 1877. Fish was born in New York, New York, on August 3, 1808, and graduated from Columbia University in 1827. He became a lawyer and also managed his extensive family holdings. Subsequently, Fish entered politics, running unsuccessfully for the New York State Senate in 1833. Thereafter, he ran intermittently for various offices, winning a term in U.S. Congress in 1842, and was elected Lieutenant Governor of New York in 1847 after an unsuccessful campaign the previous year. 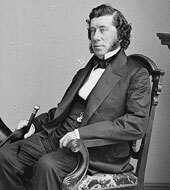 Fish was elected Governor of New York in 1848, and then to a term in the U.S. Senate in 1851. When the Whig Party disintegrated, he joined the newly formed Republican Party, partly because he saw Democratic policies toward Cuba as unethical and unwise. During the Secession Crisis, Fish was involved in attempts to resupply Fort Sumter. During the Civil War, he served as chair of the Union Defense Committee of New York as well as on a commission to watch over the condition of Union prisoners of war and prisoner exchanges. As a result of Senate objections over Grant’s initial Cabinet choices in 1869, James F. Wilson, the original nominee for Secretary of State, withdrew, and Grant asked Hamilton Fish to serve in his place. Fish was surprised by the offer and initially declined, but ultimately accepted after Grant sent his nomination to the Senate without waiting for Fish’s reply. After completing his service as Secretary of State in 1877, he retired from politics. Upon becoming Secretary of State, Fish first faced the challenges related to the unpopular Johnson-Clarendon Convention, an agreement made to resolve Civil War disputes over issues such as the British-built Confederate warship Alabama. On April 13, 1869, the Senate overwhelmingly rejected the Convention. U.S. attempts to continue to press claims stemming from British recognition of the Confederacy’s belligerent status were hampered by the possibility that the United States had considered granting the same status to anti-Spanish rebels in Cuba. The Americas were central to Fish’s foreign policy. Working with President Grant, he tried unsuccessfully to acquire new territory in the Dominican Republic, as well as the lands controlled by Hudson’s Bay Company, which the British Government instead sold to Canada in 1870. In 1868, a revolt against Spanish rule began in Cuba that became known as the Ten Years’ War. In the United States, Spanish attempts to crush the insurgency aroused strong public sympathy for Cubans. Fish worked closely with Senator Charles Sumner to formulate a policy on the Cuban situation. They recommended and finally convinced Grant not to recognize Cuban rebels as belligerents in an effort to protect American commerce and maintain peace with Spain. Over the next several years, incidents involving Spanish attempts to suppress the rebellion in Cuba led to diplomatic tensions. Fish eventually began to pressure Spanish officials to consider granting Cuban independence and ending slavery on the island. The Spanish Government did neither during Fish’s tenure. Eventually, on February 4, 1877, U.S. Minister Caleb Cushing signed a protocol with Spanish Foreign Minister Fernando Calderón, in which Spain agreed to greater due process for U.S. citizens in Cuba. Later in Fish’s tenure as Secretary of State, he faced Indian raids and poor law enforcement along the border with Mexico, an issue which would escalate under Fish’s successor William Evarts.